The Point Six IR Point Sensor-LL is a battery operated infrared beam People Counter with a 418 or 433 MHz radio transmitter. 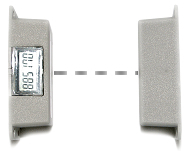 The sensor consists of two parts; the IR transmitter and the IR receiver. The IR receiver has an integrated 6-digit LCD counter and a radio transmitter for truly wireless installation and operation. The IR transmitter produces 32 pulses of high intensity IR each second across a distance of up to 30 feet. The nature of these IR pulses is such that the IR receiver can distinguish them from any other source of IR. This characteristic allows the IR sensor to operate in almost any environment without interference from ambient lighting.